Friends are one of Midlife's greatest blessings - true friends enrich our life immeasurably by accepting us for who we are and choosing to share their lives with us. As I look back over 50+ years I am so grateful for the friends I have gathered along the way - both old and new, and those somewhere in between. My oldest friend goes back to our mothers being pregnant together - she was born a few months after I was and we have grown up together - that's 55 years of being part of each other's lives! I have another friend who I've known since Primary School - she and I have walked very similar paths, she was one of my bridesmaids and we are still friends now. Then there is a handful of close friends - the ones who have been there through thick and thin - the ones who listen and empathize through the good times and through the painful times. The friends who always have time to catch up for a coffee and a chat. Some I've known for decades, others for less time, but each has a special place in my heart. These friends help me laugh, they've been there when I've cried, they share their hearts with me and I share mine with them. Friendships take on many shapes and forms, but loyalty, trust, humour, authenticity, empathy, commitment, and love are all part of the mix. As I've gotten older, the number of friends has whittled away with distance, circumstances and choices that moved us in different directions, but those friends who have a place in my heart are more valuable than I can say and more appreciated than they will probably ever know. 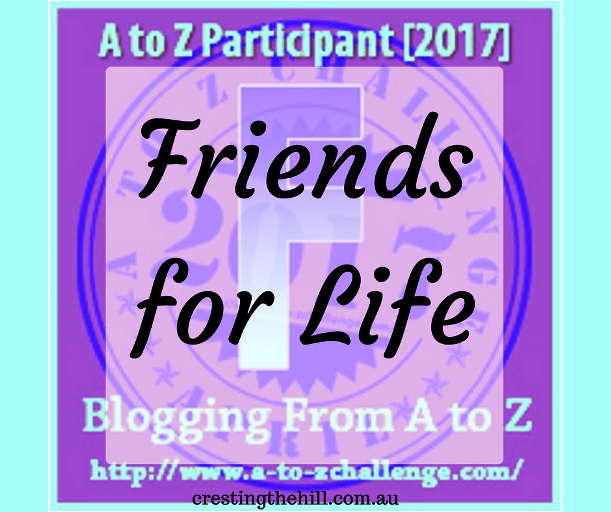 If you'd like to read more about Lifelong Friendships you can go HERE or HERE. See you tomorrow for G - which is for Gorgeous Grandbabies. Lovely look at friends. 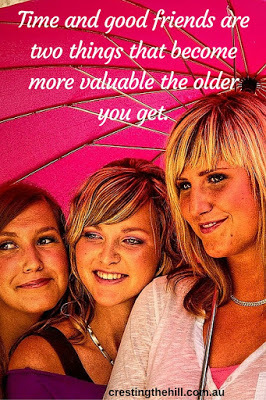 The older I get the more important friends are to me. I have friends from all eras of my life Leanne. Tomorrow a relatively new friend of 7 years and I are going to My Fair Lady. You don't need many friends and also I think I've realised that throughout life friends may come and go but they were important at that particular time of life. Lovely post.I have a few close friends from school and college.My hubby is my Best friend from college .So I understand what you mean about the importance of friendship. Some friends are forever. Yes thank goodness we have Facebook and whatsapp etc to keep in touch. Friends make life awesome! They are indeed valuable. May we all be blessed with friends for life! What would we do without our girlfriends? They get us in ways others (especially men) just can't. Lovely post. I think that's the best relation to survive that age! If not for friends, I don't what I would do then! I have a couple of friends from childhood. They mean the world to me. I even wrote a post last fall about the power of friendship. Great topic. Facebook is GREAT for keeping up with "not so close but still dear friends". Over the past 7 years or so we had reunions of primary, high school and college classes, and it has blown away my mind how connected I felt after all those years. We share the same roots. Also it was amazing to experience how little people have changed. They may not have all their hair or a few pounds more, but they still walk, talk and laugh the same way!! I think you have chosen a truly wonderful word, midlife friendship is something that would remain with you for all your life.